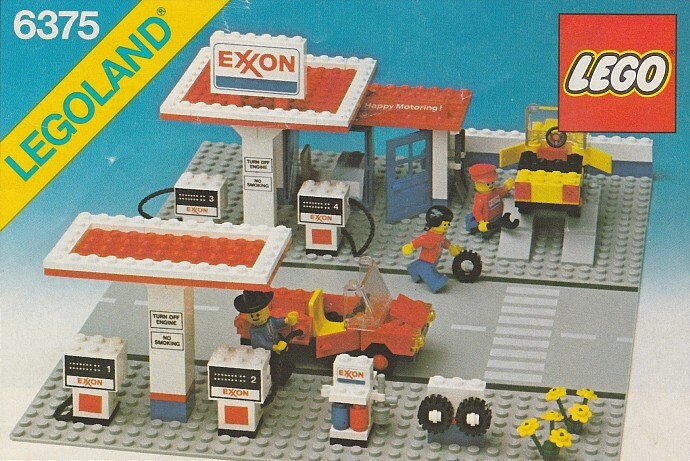 Today's random set is 6375 Exxon Gas Station, released in 1980. It's one of 17 Town sets produced that year. It contains 267 pieces and 3 minifigs, and its retail price was US$20. It's owned by 671 Brickset members. If you want to add it to your collection you might find it for sale at BrickLink or eBay. I like it when actual brands make their way into sets. It adds a bit of realism to my town. First Lego Town set I ever got. Christmas 1980. Got this and Empire Strikes Back sheets. Opened it up and grandparent's house and sat at my grandfather's desk and put this together first thing! Best Random Set of the Day... EVER! How many other mentions of smoking have made it into Lego sets? So few pieces but used so effectively; the play value is immense. Sometimes I need reminding that LEGO is, primarily, for children to play with, and not about ultra-realism. I got this set way back when. It was my favorite. This one was well before my time, but it's still gorgeous, isn't it? Life cannot be this generous. So many classics back to back. Thank you Huwbot. Ha, we never got this in Europe. Only other set to ever have that large window frame in blue. @Kynareth: Those same stickers are on the https://brickset.com/sets/5540-1/Formula-1-Racer. I always think when I look back "so few pieces, so substantial sets with such a lot of play value". @rslotb, ah, a very different era of motor sports! The 2nd or 3rd set in my and my bro's city set. Great classic. Still have some of those pieces held together by the stickers. Loved taking apart and rebuilding those cars, still love that design today even though my kids like the easier cars of today. Hours of my childhood were spent raising and lowering cars on that lift. And the guy in the cowboy hat was our classic "Texas business man" in many of our adventures. I actually don't like it when LEGO uses real life brands. Stuff like Octan or Borg Industries or the Classic Space logo create this sense of interconectability and originality that makes the LEGO world feel like it's own magical little universe. This gas station is on both sides of the road. Very convenient except when you want to pay in cash and you have to cross the highway to pay. Seeing sets like this gives me warm fuzzy feelings. Nothing better than a 80s gas station with a guy wearing a ten gallon hat, a la JR Ewing from TV's "Dallas." This was my second set, after the Police station, and I loved every bit of it. I still have the pumps in my parts bucket held together by the stickers. Wish we could get a re-release of some of these classic Town sets, though. I had completely forgotten about this set. This was another one I wanted as a kid but never got. @HOBBES I'm pretty sure that's the same seller that I got my Palace Cinema SW Episodes 4,5,6 movie stickers from. They were very good quality on par w/LEGO, and now my city's minifigures can watch SW all the time at the big screen! Lucky little buggers :) As for this set it's so simple yet perfect and has been on my Wanted List forever! @leetshoe , there's a crosswalk on the road at least. As far as this set goes, it shows how simple yet effective old style builds used to be. I won't count the late 90s "town.jr" as those premade 1 piece chassis weren't much different concept from the current Junior/4+ line. One of my first sets... long gone now. A real company, not some generic name. Working lift and insertable gas lines. 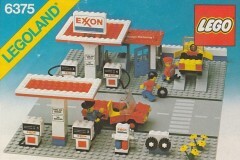 This was truly a great set for play and one of the first road plates I owned. I got more road plates soon after and then kept rearranging them to try to match areas of the map on the inside wall so the attendant could give directions to drivers stopping for gas. Thanks Huwbot for this classic memory. The last topic I commented on was 6390 Main Street, which this set perfectly fit with. I still have my set in its original box, including the hard card of a mock town layout that contained the baseplate, and the stickers on the bricks. As stated earlier by another, this set has great play value given the small number of pieces. It also fits perfectly with the 554 Fuel Pumper, the Exxon Tow Truck with car and the last Exxon Fuel Truck Lego produced. I spent countless hours with this set and the rest of my late 70's/early 80's other sets in the basement building all sorts of town layouts.